Home > Pasta/Rice/Grains > I Due Pastori Grappolo d'Uva 6 Colour Pasta 250gm. 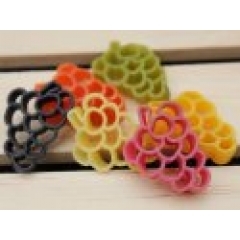 This delicious, stunning 6 coloured artisan pasta is handmade in Italy. It has been air dried at low temperature over extended periods to ensure the integrity of the ingredients and to maximise the flavour. Made from all natural ingredients including carefully selected high quality durum wheat semolina flour and spring water. Utilising natural dyes to create vibrant colours that complement the beautiful shape. Ingredients: Selected durum wheat semolina, water, tomato, beetroot, spinach, turmeric, squid ink.